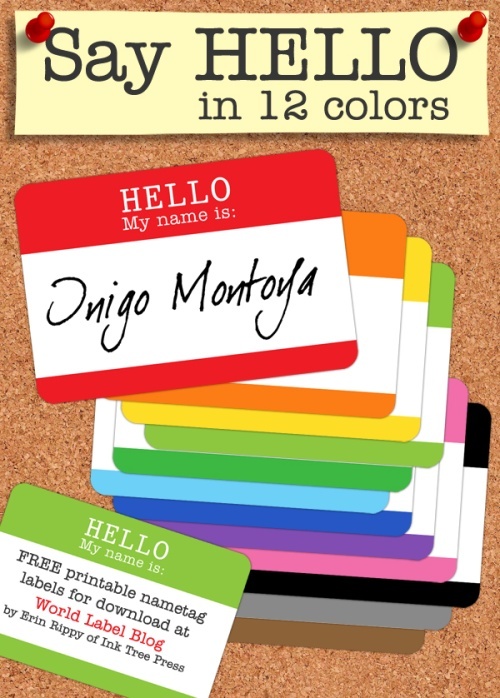 Name Badge Labels in templates for printing on you laser and inkjet printers. 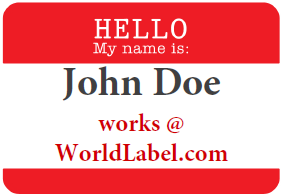 Use with adhesive labels WL-5030 Name Badge labels or use our Full Page Labels to print and then cut out. Templates are free to download- they are fillable and you can change font sizes and types. 12 different colors to choose from. Labels are in editable PDF Templates – Yes, you can change font types, colors and size. Templates are cross platform and will work on you Mac, Windows andLinux operating systems. For best results use Adobe Reader 9 or highter. To change fonts: type, size or color, (as well as bold, italics, etc.) select Control +E if you’re using a PC or Command +E on a Mac. A toolbar will appear giving you additional text properties. Select “More” in the font properties toolbar for paragraph alignment and more. This entry was posted in Label Design, Labels & Printing, Productivity and tagged labels, name badge labels, name badge templates on July 2, 2012 by wlmanager. These are really cute.. thank you so much.. These are really going to come in handy and next years convention. Thank you World Label. Thank you so much, this really helped me know my students names and they had fun picking their favorite colors! Seriously professional name badge labels with high quality feel and appearance. The labels are easy to pull off the back and adhere well to use. Thanks for sharing.